With just one healthy professional goalie under contract, the Vancouver Canucks were playing with fire. On Monday, they got burned. 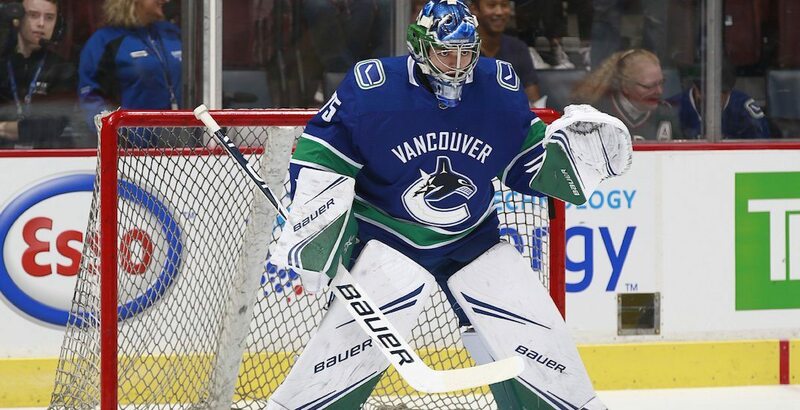 With Jacob Markstrom banged up, the Canucks were forced to play 19-year-old prospect Michael DiPietro in goal against the high-powered San Jose Sharks. DiPietro is a promising prospect, but he’s still a junior goalie, playing in the OHL. To throw him into NHL game action now, against that opponent, was putting him into a position to fail. Most people felt bad for the kid. Players felt awful that they hung him out to dry. Fans on social media expressed sympathy. Fans in-arena gave him loud cheers for saves, and not in a sarcastic way that you’d expect for a goalie during a blowout (they saved the sarcastic cheers for Canucks skaters after they registered their first shot on goal midway through the first period). Instead of playing desperate, like you’d expect with a team protecting a junior goalie out of his element, the Canucks were pinned in their own end for most of the first period. The first shot on net went in, and the score was 3-0 before the period was half over. They went on to lose 7-2. They got some bad bounces, sure, but it was a brutal situation to put DiPietro in. It was a combination of poor planning, risk-taking, and bad luck. Instead of starting the season with five goalies on two-way deals, like they’ve done in the past, the Canucks had four. Richard Bachman suffered a season-ending Achilles injury in late December. The timing of that injury couldn’t have been worse, as the Canucks planned on calling up Thatcher Demko in January. They traded Anders Nilsson to Ottawa for Mike McKenna, planning to send him to Utica to take Demko’s spot. McKenna was claimed on January 4, meaning that in the span of a couple of weeks the Canucks went from four goalies to two. When Demko suffered an injury last week, they were down to one. At that point, we called it a short-term goaltending crisis. On Monday, Markstrom got hurt too. Just what ails Markstrom is anybody’s guess, because the Canucks’ messaging was vague as can be. Before the game, the Canucks said Markstrom was not available for the game, yet he sat on the bench as DiPietro’s backup. “We had to play Mike. We didn’t have an option,” said Green. Markstrom is day-to-day, and Green says he’s “hopeful” that his No. 1 goalie will play Wednesday in Anaheim. But the Canucks play the next night in Los Angeles and Saturday in San Jose, leaving them very little room for error should Markstrom be sore after one of those games. The team didn’t want to trade a draft pick for a short term goalie fix, but that’s just what they did on Tuesday, acquiring AHL goalie Marek Mazanec for a seventh-round pick in 2020. GM Jim Benning had the option of signing a less accomplished goalie on an AHL-only contract – playing for Utica or otherwise – to a two-way deal for the rest of the season, but chose Mazanec instead. The Canucks were essentially screwed over by the Philadelphia Flyers, who not only claimed Mike McKenna off waivers, but decided to keep him despite having four (!) other goalies ahead of him on the depth chart. It’s a stockpile of goalies that you usually only ever see in Yahoo fantasy hockey. The Canucks were likely hopeful that McKenna would eventually end up back on waivers, allowing them to continue with Plan A.
Philadelphia played McKenna in just one NHL game after claiming him more than a month ago. Instead of tossing him on waivers when they no longer needed him, they put him on an AHL conditioning stint. On Sunday, they had three goalies – Brian Elliott, Michael Neuvirth, and Anthony Stolarz -on the ice at practice, with a fourth netminder, Carter Hart, healthy. #Flyers send goalie Brian Elliott to #LVPhantoms on a conditioning loan. Mike McKenna's conditioning loan ended, but Elliott's is just beginning. 3-in-3 coming for Lehigh Valley this weekend. McKenna’s loan ends today, just as Brian Elliott’s starts. The Canucks, finally, aren’t waiting around for him.